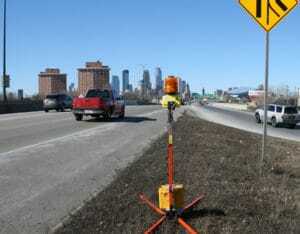 Traffic detection systems can sense, count, and send messages to people in motion. We created the Traffic Detection solution to help you understand who’s accessing certain areas and respond to those users. Need to know how many pedestrians are visiting a particular park or how many cyclists use a certain path? Want to know when a road is busiest so you can plan for construction crews? With a full traffic detection system in place, you can find out just about anything you need. We use products like cycle counters, pedestrian counters, license plate recognition, and stop bar detection to create feedback systems. These systems register motion and trigger resulting actions, such as alerting drivers when a caribou is crossing a highway. Whatever information you’re looking for, we can help you collect it and apply it to your traffic needs. We can meet with you to talk about your goals and how you’re going to use the information you collect. We’ll also audit your road or intersection to evaluate your current setup and determine how we can make it better. With that information in hand, we’ll match the right combination of products to your exact needs. We carry a range of products from the industry’s leading brands, including Global Traffic Technologies, Houston Radar, and DataCollect. These products can be combined into a custom system and integrated with Ver-Mac message boards to communicate the information you gather. For example, if a driver is travelling over the speed limit, your system can detect it and trigger the board with a message to slow down. If traffic is moving more slowly, the board can alert drivers of the delay and tell them how long it’ll take to reach their destination. Our installations team can commission any system you need. No matter how remote the trail or busy the road, we can set up your traffic detection solution right away. We can also maintain your system as needed. All parts are covered under the manufacturer’s warranty, and with an extended service plan, you can keep gathering information without any gaps or delays.